The information technology (IT) sector accounts for a whopping $3.8 trillion in global revenue. This industry is innovative by definition. Does this apply to their office space as well as their product? Yes! When comparing the workplace needs of technology companies against general industry, unique needs arise. The largest of these firms are among the world's largest, and growing at a fast rate. Plus, with minimal fixed assets, tech companies start (and fail) regularly. If you are designing an office for a modern tech company, you'll want to follow these core industry design principles. One of the reasons investors focus on technology is the ability for infinite scale. Meaning these companies can grow with lesser investment in hard assets and people versus brick-and-mortar or professional services companies. All that said, similar to other industries, people are your most valuable asset. So avoid the sterile look often associated with high tech. Modern office design must enhance productivity, and that means giving teams spaces to collaborate. Add in human touches like gadgets and color that spark creativity and communication between players. It is safe to assume you are designing a modern look. You are not held back by existing furnishings or a poorly lit space. And nearly every firm in the industry a spearheading a new way to make life and business better. So think about how your design and gadgets can showcase the future. This is especially important when it comes employee workstations. Make sure your budget gives workers the tools they need. As we move around the office when our electronic devices, desks, conference rooms and common areas should have electrical outlets everywhere. You should use modern office furniture that is comfortable, ergonomic and flexible as use of a space changes throughout the day. Self-help kiosks for visitor registration, the cafeteria and conference room reservations will also convey modernity while boosting your company's productivity and results. 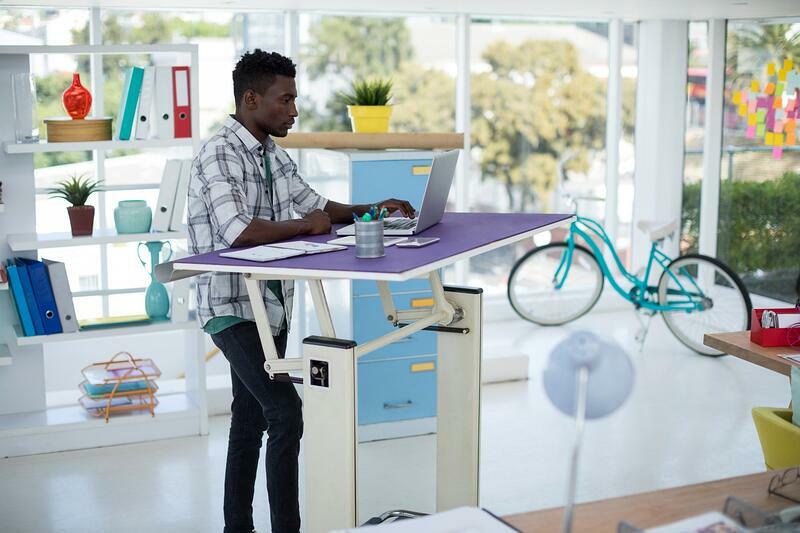 Lauren Germania, an interior designer who specializing in tech company offices, has argued that "designing office is all about brand interpretation and actualizing their office culture." She suggests the best tools to workplace design tools to accomplish this are "art, furniture, lighting and design finishes". As companies mature, they might move from a coworking space into their own office. For many organizations, this is the first time they think about their branding beyond their logo and home page design. 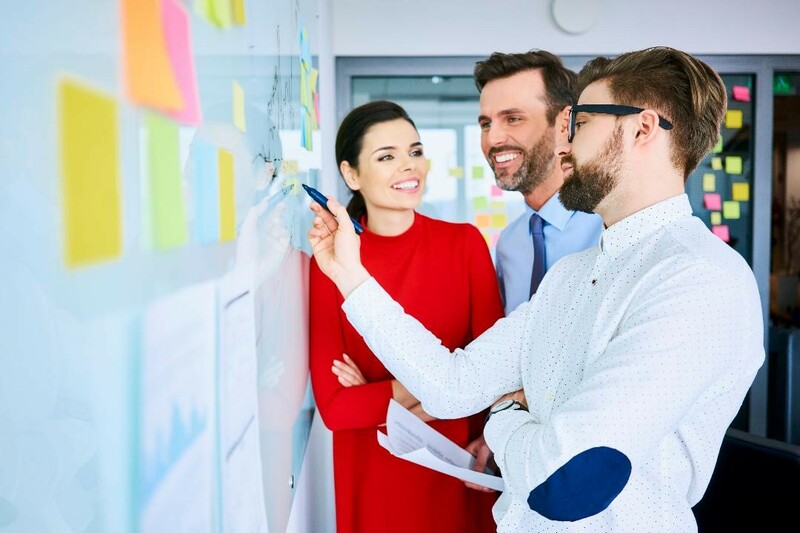 Not only does it help potential employees determine whether or not your company is a great fit, it reinforces your mission to employees on a daily basis. Some generals rules though call for intimate spaces to have warm lighting, low ceilings, drapery and multi-purpose furnishings. Open and larger spaces should have cooler lighting, high ceilings to give power to the size of the spaces. Instead of plastering logos everywhere, use artistic renditions of brand marks. Try to showcase a future world where everyone is benefiting from your products and services. Want some inspiration for incorporating elements of your brand, collaboration and modernity into your office design? 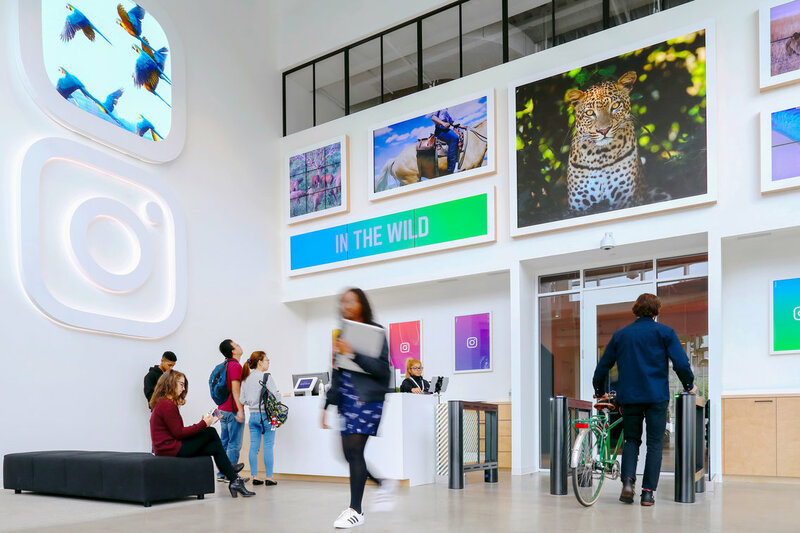 Let's look at what Germania did for Instagram when they moved into new office space in 2016. She wanted to connect the company's old school photo filters with their high tech core. So the furniture and waved together the mechanical and digital office. Her favorite examples are vintage cameras throughout the space and warm wood furniture in front of high tech employee workstations.